Free download XnView latest version 2.40 for Windows. It is a nice edition for windows in the list of image viewers. XnView is developed by Pierre-e Gougelet. 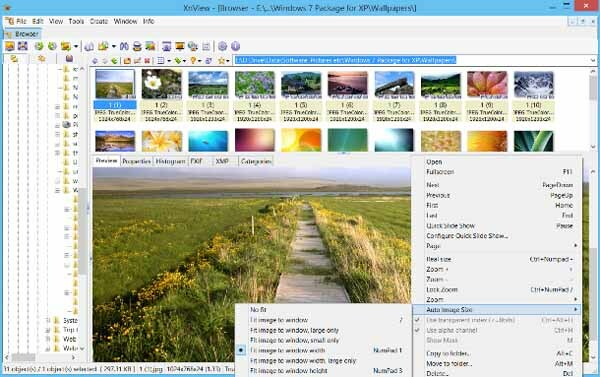 XnView for Windows is an image views with various options and features. XnView is available free for your computer. XnView for Windows is very light weight and easy to download and install. You can download the setup file from the download link given below. XnView will take few seconds to install. During the installation, you are asked to install Maximum, Custom and Minimal installation. You should select Maximum for best performance. When you open the XnView program, you will see the explore of your PC at the left side of the program. You will see the folders with thumbnail at the top of the program. Below this, you will see the image view you select at the above. There are many settings you can change for your image viewer. For example, you can set the image size fit to window. You can select it as fit to window, large only. It means that the image with large size will fit to window. XnView also provide you the facility to play slide show for your images. To enable slide show, select the images from the top where you see the images. Now click on Slide Show from the top menu bar. This will show you some settings. You can set the wait time for your slide show between images. It also enables you to set the full screen or your custom size for your screen.